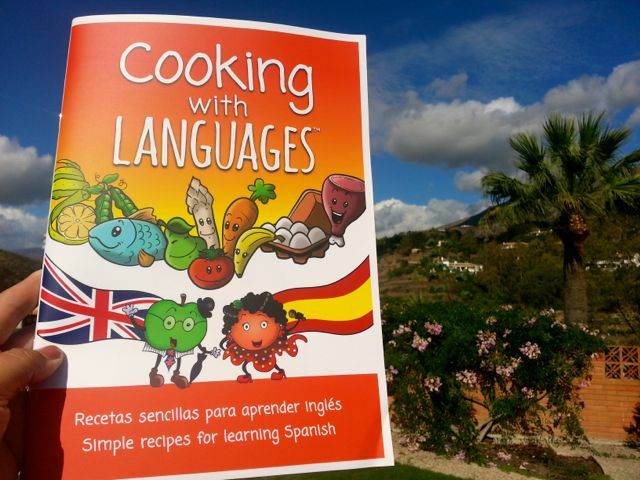 At Cooking With Languages, our aim is to make language learning fun. Our mission is to encourage more children to want to learn languages. Our first bilingual activity cookbook, designed for children learning English and Spanish is jam packed full of fun language learning activities. There are many reasons why our book is great and why it will help you and your children to learn new languages. All Content Is In Both English and Spanish! One of the great things about our bilingual activity cookbook is the fact that all the content can be found in both English and Spanish. 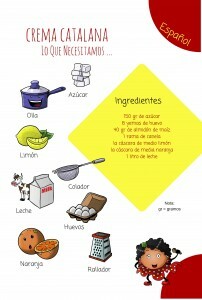 That allows children to read the recipes in both languages and learn lots of new words and phrases. At the same time, young learners will learn the structure of sentences in both languages, aiding them towards speaking like natives, without even realising it. Being able to check out all the content in both your native language and your target language really does help towards understanding how natives of both languages express themselves and structure their sentences: all languages work differently, so this is a really great way to get a gist of the way these two languages are used. Being able to read the recipes in both languages is fantastic but what is really important is that the content is great and our activity cookbook really offers great content for learning. Not only do we offer simple but scrummy recipes that everyone at home will love, we offer well-structured texts, with plenty of useful vocabulary that children will love learning. Words and sentence structure have been kept simple but natural, so children will be able to understand and remember easily. 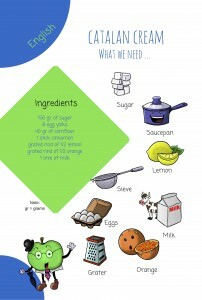 We are all about having fun while learning, and our activity cookbook really does provide this. The recipes we have thought of are not only scrummy, they are also really fun and simple to prepare! So, if you want to spend some quality time with your children while preparing some simple but scrummy meals and learning together a new language, our cookbook is for you! Arthur Apple and Nerea Naranja: Our Fun Assistants! 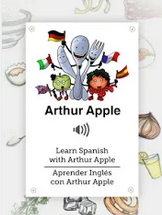 Arthur Apple and Nerea Naranja are our assistants in the kitchen (our classroom). 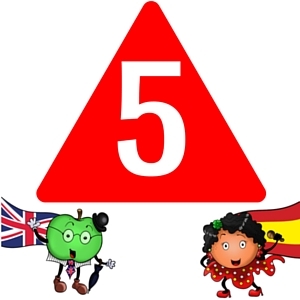 They are here to help you with our recipes and with your language learning! 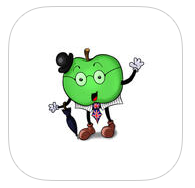 The character designs are great, fun and appealing for children. 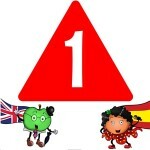 Arthur Apple and Nerea Naranja will definitely catch your children’s attention and make them keen to cook, play and to start learning languages. 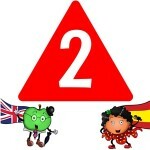 Children love cartoons and Arthur Apple and Nerea Naranja are the perfect characters to help and guide your children towards learning new languages. What child doesn’t like to have a fun friend to help them? NOTE: We are developing more apps to allow children to get to know the language assistants better and to be able to ask them how to say certain words. Plenty Of Games and Activities To Practise! Having lots of content to learn from is fantastic but, of course, most of our learning happens when we have to think and reason what the answer is to a question and that is why our activity cookbook also provides you with lots of great, fun and entertaining activities. These activities allow children to practise and strengthen everything they have picked up while reading and talking as they were preparing our simple but scrummy recipes. Our activity cookbook provides you with a wide range of activities for your children to have fun and enjoy themselves while cooking. 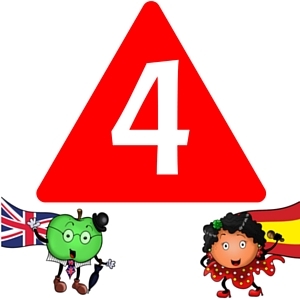 With our activities and the help of Arthur Apple and Nerea Naranja, they will learn and build up new vocabulary in their target language so that the can eventually speak like natives. It is always said that we shouldn’t judge a book by its cover but, of course, the first thing that you see when you pick up a book is, in fact, the cover… and our activity cookbook has a fine one! It showcases some of the artwork you will find inside and introduces our language assistants. All the illustrations and artwork in the book are bright, cheerful and fun. When teaching children, it is important that they don’t see books as something boring and dull. Having great illustrations all over the pages will definitely make your children want to use our book. The pictures and artwork used in our cookbook have the purpose of facilitating the learning task for even the youngest learners: most vocabulary is accompanied by a picture so that the learner will understand what the words mean straight away. This technique will allow children to slowly start thinking in their target language as they are not learning new words by translating them from their native language. They are creating new “shortcuts” in their minds which, in the long term, will allow them to speak like natives. The best way to learn is by having fun and engaging learners with entertaining content. 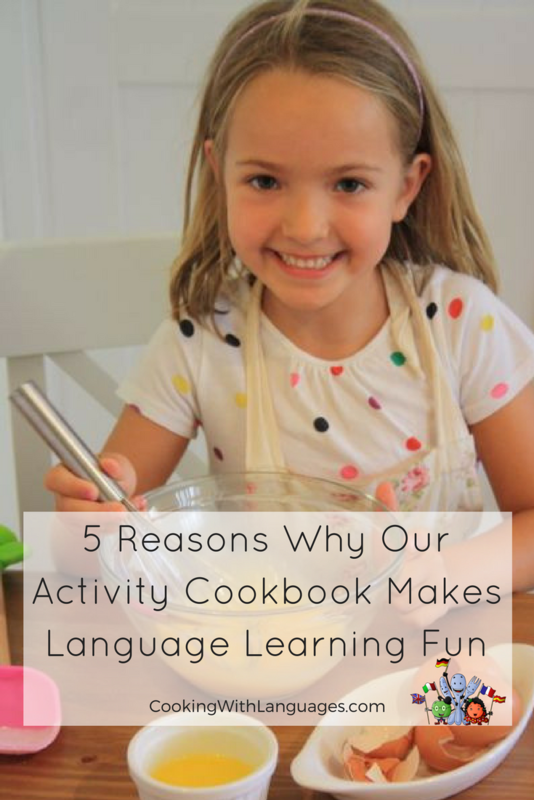 Our activity cookbook offers great content and lots of fun so, it is perfect for learning languages. Wouldn’t you agree? Support our Crowdfunding Campaign and find out how you can get your Early Bird bonuses … Let’s make language learning fun!